“Muninn” opens with the blue flames of Wednesday’s (Ian McShane) sacrifice. It’s a moody and dreamy scene, and an indicator the episode will be much closer to the atmospheric feeling of Season One than “The Beguiling Man” was. Wednesday had left his car, Betty, on the train tracks that Shadow’s (Ricky Whittle) train was on. His plan worked exactly the way he knew it would—Betty exploded, along with the train. In the process, Shadow is hurt and Laura (Emily Browning) falls to pieces. Mad Sweeney (Pablo Schreiber) and Wednesday have to pick up Laura’s body parts in a funny yet gruesome scene where they plop her into the trunk of the newly reborn Betty and take off, leaving Shadow—again—to fend for himself. It appears that everyone loses something except for Wednesday. Sacrifices are all about giving something up to get something in return, and this episode emphasizes how difficult that trade can be—unless you’re the god pulling all the strings, who seems to be getting along just fine. Although the group is separated from Shadow for the time being, they’re all going to the same place: Cairo, Illinois (pronounced kay-row). The return to Ibis’ (Demore Barnes) funeral home is a nice reprieve, allowing the group to reset, some more literally than others. Laura is stitched back together, and she learns she has about a week left until her body likely decomposes beyond use. Mad Sweeney wants to continue his plan to go to New Orleans to make Laura alive again, so he can get his coin back. But Wednesday says he needs Laura to go see a god: Argus Panoptes, the all-seeing eye, who has transformed in America to a god of surveillance. Ibis is a good storyteller, and his introduction for Argus (Christian Lloyd) is a nice interlude, using a carousel-like device to play images, reminiscent of the carousel in the season premiere. It’s a fitting storytelling device for Argus, whose all-seeing eye can see 360 degrees and whose story keeps recycling over and over again. In “House on the Rock,” Mr. World (Crispin Glover) uses Argus to get eyes on the old gods, so it looks like Argus is either playing both sides or doesn’t care who uses him. The same could possibly be said for Laura, who ditches Mad Sweeney and goes with Wednesday, and along with his promise of a recharge for her heart. Argus’ warehouse of memories is a delightfully creepy journey for Laura and Wednesday. Each room they enter acts as a kind of escape room, filled with a memory of an old version of Argus to whom they have to make a sacrifice before they can leave. 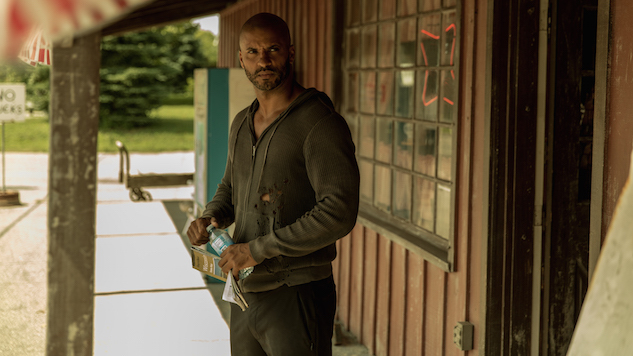 The weirdness of American Gods shines in these scenes, and Wednesday and Laura are a pretty equal match for each other. Laura quickly catches on to what they’re doing and shows she’s ready to make a few sacrifices herself, like burning down the memory of the library in Alexandria. But Wednesday eventually gets the best of her, convincing her to kill Argus herself, giving a jolt to her heart. But what is Laura giving up in return? Laura and Wednesday aren’t the only ones interested in Argus. Mr. World sends Technical Boy (Bruce Langley) and the newest god, New Media (Kahyun Kim), to the same place to try to get Argus on their side. I like the idea of New Media, but she’s not wrong when she says that she and Technical Boy feel a bit redundant. They have similar attitudes, and they control such similar things I’m not completely clear on what the difference is. They even have a similar style, using colorful patterns to mimic the feeling of too much media and technology all lit up at once. Away from Argus, Mad Sweeney and Shadow are running into some luck—bad luck for Mad Sweeney and good luck for Shadow. Mad Sweeney is attempting to go down south to New Orleans, but without his lucky coin, it doesn’t look like he’ll make it very far. Shadow, however, runs into Sam Black Crow (Devery Jacobs), who calls him out when he’s trying to swindle the gas station attendant and then gives him a ride to Cairo. She and Shadow are a good pair—they are both gentle yet tough—and I’m sure we’ll see them together again. For now, Sam leaves Shadow in Cairo, where he finally meets back up with Wednesday. Shadow is angry at first, as he probably should be. But Wednesday is a master at getting people to sacrifice something for him. He tells Shadow that if Shadow doesn’t feel better in the morning, he can leave with Wednesday’s blessing. With a shared drink, their pact is sealed once again. Shadow might not yet know all that he’s giving up to follow Wednesday, but I hope it’s worth it in the end.